When I decided to make ‘Gone Fishing’, I knew it would open doors. But I didn’t realize just how many it would open, and how many of those doors would be in Hollywood. I am working flat out with Judy Goldberg right now, penning a feature script for a major Hollywood studio – and it’s REALLY hard work. But whenever I get down or tired, I remind myself that I really do have the very best job in the world. Truly! As serendipity would have it, I just got contacted by John Truby, US script guru, who is coming to London on 12/13 September to run his two day workshop for writers (at Craven Street Rehearsal Rooms, 10 Craven St, London WC2N 5PE). I took his course about four years ago and I found it really useful (and actually made three new writing friends who have gone the distance with me too). John has a 22 step structure that to this day, I refer back to. And we are using it right now as we develop this script too. So if you are interested in attending his workshop, we have a special deal for you. In fact we have two deals for you! Less than 24 hours after flying into Australia, I was lined up for my two day Guerilla Film Makers Masterclass. I can tell you I was quite nervous as among the group were film makers who had been cameramen for 40 years, actors with over 50 features under the belt and a director searching for his next feature, he had only made four features so far! So when I kicked off, my heart was beating pretty fast. I need not have worried though as I was among friends. The guys in the room were everything I love about film makers. Open minded, playful, generous, challenging, entertaining, thought provoking, and yes, as Pancho (who you saw lots of in the video) in search of greater truths, a worthy quest for anyone. And Pancho, who is exactly like he is in the video (bonkers, but in a good way), is an extremely successful photographer who became the darling of the festival as he worked so hard taking amazing photos and infected everyone with his charming personality. The two days whisked away in a blur, separated only by a whistle stop tour to a genuine Aussie BBQ with G’Fisher AP Simon VanDerSpoel and his lovely family and friends. Boy do the Aussies have an amazing lifestyle. Makes me wonder why so many of them are in London! Over these two days I became aware that in the room were new friends, and new possible collaborators. This was a truly unexpected gift and I look forward to seeing how things develop. I also took a call with the Aussie equivalent of the UK Film Council, about bringing one of the features I am working on, ‘From Beneath Us’, to Australia. And we made good headway. So it’s possible I may be jetting back sometime soon. And between us, I could not think of a better place to shoot the movie, if the guys on the seminar were anything to go by. The festival Gala Opening was awesome too, and if you listen to the soundtrack, you will hear that when the audience clapped and cheered at the end of Gone Fishing, they also started stamping their feet too! That’s never happened before. The picture on the video is a GREAT indicator of the tone of the festival and the Aussie film business too. It’s a shot of the guys who made Mankind Is No Island, featured on the blog a could of days ago, hauling festival director Toni Powell out of the Gala Opening, in costume for a new project they are promting – they are dressed as the Design Crimes Police. Gotta love em! I have not fixed a date yet, but I will be running the masterclass in the UK in a few months, so if you would like to attend, drop me an email at mail@livingspirit.com, and I will be in touch when I am back in a few weeks. FilmSpecific.com's Stacey Parks interviews me! I just did a great interview with Stacey Parks here in LA. Stacey is a distribution guru who runs her own site called FilmSpecific.com. We have been in touch for a few years, and last year I did a seminar at Ealing Studios with her, when her latest book was released. You can listen to that interview here. For those of you following me on Twitter you know that I had a great time in Malibu on Saturday. I even uploaded a photo of me at my favorite Seafood Shack NEPTUNES NET on Facebook. You can check it out on there! Other than that, I actually started off the weekend with a very inspiring interview I did with filmmaker Chris Jones. (Chris is also author of the Guerrilla Filmmaker Handbook series). 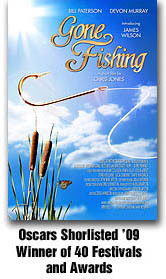 Chris is just winding down off the festival circuit with his Oscar short-listed short film called GONE FISHING. For all of you out there who have a completed short, or are thinking of making a short as a career move, you've got to check out this interview I did with Chris! I've been following his webisodes for a year while he's been on the film festival circuit and have been waiting patiently to corner him for an interview. And I finally did it! I don't want to give too much away but let me just say there is a whole new model for short films emerging - and it involves the power of Webisodes and Viral Video. OK, but before I link you to the Chris Jones case study I wanted to go over a few tips for leveraging Viral Video for your own film, whether it's a feature, doc, or short. There were some questions pertaining to this on one of my group coaching calls recently, so I figured it's a good time to tackle this. 1. Be sure to upload your chosen video clips to multiple platforms including your blog, your Facebook Film Page, your You Tube channel, even Twitter. 2. Remember that for any video clip or webisode to go VIRAL, it needs to be good enough, or compelling enough for people to want to pass it around and forward it on to their friends. So what's so special about your video clip that will make them do that? 3. Always link to your main website or blog from the video, either by putting a watermark on the bottom, or have it be on the last frame so people can immediately link off to your site and find out more about your film, or buy a DVD copy if it's available. 4. Remember to make your videos FUN. You want people to look forward to seeing the next installment. If you can engage people enough with your videos, you have a great shot of getting them to want to watch your film. And this is how you can begin to build your audience. 5. For the love of God, make your video easy to watch by using one of the flash based services like You Tube or Vimeo. There's nothing worse then pressing play and having to wait for a video to download. You'll lose people's attention IMMEDIATELY. If anyone has any examples of great viral videos they want to send along, please do. I'd love to see them! Thanks for the write up Stacey and I really enjoyed our interview! We just got a write up in one of Australia’s (East Coast anyway) more important news papers. It’s about the Heart Of Gold Festival, north of Brisbane, in a couple of weeks time. You may know I am flying out there to hold a new two day Guerilla Masterclass and I am really looking forward to it. Here is the link to the online version of the article (and I hope more press follows too). If you are in Australia and do fancy coming to this Masterclass, sign up now as Toni tells me it’s starting to sell out. Click here. I am really looking forward to Heart Of Gold as historically, when Gone Fishing plays at festivals that have just the right temperament and character (such as Sedona or Rhode Island), the experience is nearly life changing for me. On the face of it, Heart of Gold has all the hall marks of this kind of event. So, come along if you are down under… I promise the masterclass will be a great event, and Toni (Festival organiser) promises the Festival will be knockout too. And if you have not joined Twitter yet, you should as I am now enjoying the Tweeting and fun and games we are all having. MAKING YOUR FIRST OSCAR WINNER... Feedback is in! The Online Guerilla Masterclass about the making of Gone Fishing is currently being updated with the extra new sections on festivals, sales, marketing, awards and beyond. Anyone who enrols now for £69.99 will get these extra sessions for free (after these new sessions are live, the price will go up). I just wanted to share with you the incredible comments that our automated feedback engine is producing. So far we have received 100% five stars out of five ratings, and delegates have truly come from around the globe – London, Australia, Canada, USA even one in China! Awesome. We worked hard to deliver a really immersive experience that any film maker would find educational and inspirational, and by delivering online, we were able to keep costs down, and pass those savings on to the delegates. This Seminar is essential viewing for everyone who either, is thinking about working in the film industry, is beginning their career, is at film school or has been creating films but not having the success they desire. I feel the seminar as a whole is catered more towards someone who wants to be a director, but as an aspiring producer, with experience in production design, I still felt I learned a lot and if your clever you can work out how to tailor the advice to your own stream. I loved the format of being able to watch the seminar online at my own pace, to fit in with my schedule and as tempting as it was to jump ahead I'm really glad I didn't. It made me feel like I was part of making the film. The applet is really easy to use, and instructions are clear. It's great that you can go back and watch over the videos more than once. you certainly pick up on new things each time you watch it! The whole seminar was incredibly inspiring. Thanks Chris, hopefully one day we'll be thanking you at the Oscars ceremony! If you would like to take this online Masterclass, you can sign up right now and be un and running in moments by going here! Yesterday I ran the final part of the Gone Fishing Masterclass at Ealing Studios. The first seminar we ran, at BAFTA last year, was all about how we made the film. This second was about how we exploited the film. The first seminar is online now, and this second one will be edited and uploaded as a bonus to the first seminar over the coming weeks. The seminar ran most of Sunday and was extremely well received, and covered festivals and sales for Gone Fishing. To really give the group the ‘festival’ experience, we also screened five other short films that represented the ‘best of the best’ from the festivals I had been too. Perhaps more than anything, watching these films illustrated the bizarre nature of film festivals, and the ridiculous idea of choosing one film as being ‘better’ than another. Each of these films were excellent in some ways. The choice of the day to host this master class was also symbolic, as the Oscars are also taking place tonight, and I fly out to LA tomorrow to begin what I hope will be a new chapter in may film career. I will be back in 7 weeks, and will continue the blog in those weeks. When I am back though, that will be the time when I make the choice to either move there or stay here in the UK. I think for everyone present, we could feel the Gone Fishing chapter closing. Of course we will still take the film to festivals; we will still support it and also use it as a ‘calling card’… But it’s time to really get my teeth into the next movie. If you want to see either of these masterclasses online, go to www.guerillamasterclass.com and sign up. Right now there is just the first eight hour masterclass, but you will get this second masterclass for free when we have it edited and online. So remember, you can buy the online seminar now for just £69 and get the second one free. After this weekend, the price will go up though. Finally, we have just built the user feedback engine, so you can now read feedback as it is posted. Take a peek here. Making YOUR First Oscar Contender! No other film award creates careers overnight like an Academy Award… As you may know, some time ago we set out to make an Oscar contender with our 35mm film ‘Gone Fishing’… Last December we got the email from Academy to let us know we were in the official shortlist of ten movies, and the ONLY UK movie at that… For six weeks, we were a whisker away from going to the Oscars! As part of the package for ‘Gone Fishing’ we ran a one day seminar at BAFTA, which was filmed and has now been expanded. We are delighted to announce that this ground breaking seminar is now online! That’s over eight hours of world class film tutoring about making a truly world class movie with very little resources. If you are wondering just how empowering the seminar is, read the feedback on the site. And remember, you can go back and retake the course as many times as you like, learning from your own computer and from anywhere in the world. The course costs £99 but is discounted to £69 until a week on Sunday… Why? On Feb 21st we will run the second seminar for the first and only time – the first seminar was ‘How to make the world class film’. This second seminar is ‘How to exploit the world class film’, and we will be covering everything from mastering, PR, sales, distribution, iTunes, festivals and the Oscars. If you sign up to the online seminar BEFORE the 21st, you will get a free seat on this seminar (London venue TBC). We are running this seminar ONCE and we have limited places. Remember, this is based on real world experiences over the last year and NOT pulled from books. We have talked the talk and WALKED THE WALK… And we are going to share it all. If you are unable to attend in person, you can still take advantage of this offer by signing up now – you will get the ‘How to make your film’ seminar now and the ‘How to exploit the film’ seminar in a few weeks time, once we have edited it and uploaded it to the site. Go one, just click on the link and take a peek – we GUARANTEE your film career will be hugely accelerated! As part of the Heart Of Gold Festival in Gympie, Eastern Australia in March, I will be running my two day masterclass for film makers (Gone Fishing is also screening too). This will be the first time I have run the seminar in Australia, and it will be a completely new and revised seminar, including all the great new stuff we have managed to collate over the last two years. I will also be announcing dates for the course in London, LA and Vancouver over the coming weeks. Above is a video that went out on Australia TV last week, and features one of our Associate Producers Simon VanDerSpoel, as well as the lovely Toni Powell who has championed Gone Fishing from the very start. Most film makers operate inside a vacuum, unable to communicate and collaborate freely with other like minded creative and entrepreneurial minds. This can stifle ANY movie maker… That’s why we are bringing The Guerilla Film Makers Masterclass REDUX to Australia! This seminar is like a House Party for creative and entrepreneurial people, designed to educate and inspire in equal measure. Just by being in a room with 25 others who share your dreams, values and ambitions is GREAT! But when the event is led by a film maker with proven record over three features, Oscars shortlisted short film and five best selling books, it promises to be a breakthrough event. This two day seminar, run by veteran film maker Chris Jones, who is visiting JUST ONCE from London, has been taught to over 1,000 students worldwide, and now he is bringing it to Australia. The seminar covers everything, from concept to completion, and beyond into career development and management, sales and distribution. It really does set out a road map for success, not just once, but for a lifetime. Throughout, we use extensive DVD clips and handouts to illustrate points. It’s not for the feint hearted too, it’s two very long and intense days as we have LOTS to get through. But we guarantee, the following day, you will see the world through new eyes. Inspired, educated and refocused. You! Yes, almost anyone who has an aspiration to communicate through film, be it arthouse or commercial action movie, be you a writer, actor or director, be you a newcomer or an old dog (like me)…this seminar will broaden your horizons. Most people become halted in their career because they can’t move beyond a few simple blockages. We remove those barriers, and the group of film makers around you quickly form a new community which will flourish. You are not alone in your madness now! The seminar is faced paced, fun, challenging and utterly inspiring for ANY FILM MAKER! Seminar leader Chris Jones offers a 100% unconditional guarantee that you will be way past satisfied with the seminar, you will be bouncing up and down with excitement! 1. Sign up for the course to guarantee your seat. Remember there are limited seats and this is the only time this seminar is being run. 2. Start making a list of questions you want to ask. Now is you chance to get straight answers. Go on, start writing now! Blimey, I think I would like to attend myself! Go ono, watch it again... It's just as good a second time! The last few days have been immersed in script development on Project Nightwatcher. It’s been an intense and demanding process, and I hope in the next few days, to report on what is actually happening and what is about to take place. 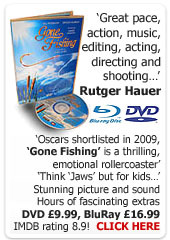 I have also been completing the Gone Fishing Seminar Video that we shot on the day of the premiere, at BAFTA in January 2008. This is a full day ‘journey’ seminar about making a world class short film, an Oscar contender if you like. I had imagined we would release this on DVD, but it’s now looking much more likely we can release on the web – this will of course save money, which we can pass on to anyone who chooses to buy it. Just reviewing the video footage, I am amazed at how much we managed to compress into that one day. I am also glad that we shot it then, because so much of the process was very fresh in my mind, and so the detail is immense. It’s also not coloured by the passing of time. You can read the notes on my blog and feedback from the actual course here. I also plan to shoot a final seminar, wrapping up the experience, discussing awards and festivals etc. I hope to do this as soon as possible, but it all really depends on whether we get the Oscar nomination or not.